Saloca in Wonderland: An instruction manual for life? An instruction manual for life? I don’t know about you, but I am not the kind of person who pulls the instruction manual out of the box before I start pushing buttons and twiddling dials. Growing up, whenever I would get something with a million tiny pieces, I remember my Dad would sit there with those illustrated manuals, laying out each piece, turning each page, and getting a feel for what needed doing in what order before delving in and putting that Barbie horse and carriage together. If it was left to me, 20 years down the line and I’d still be trying to figure out how to latch those doors on! I’ve always been a do it now, figure it out later person. And that doesn’t always end well! From being convinced something is broken because I’ve missed a connecting step, to something not sitting quite level because I ignored the visual manuals step by step guide on balancing each end for a perfect level finish. I drive the Mr crazy, because just like my Dad, he really wants to check over the instructions first, and I’m already in the box and throwing nuts and bolts around the living room like confetti. And let me tell you, those nuts and bolts are not just for putting the new standing fan together, I’m talking about the nuts and bolts of life here too. With the Barbie carriage, the standing fan, every piece has a place, and every piece goes in that place in a particular order. If done correctly, woohoo! You have a functioning Barbie carriage and a room cooling standing fan. But if they don’t function? If they don’t turn as they should? You can go back to the beginning, and start again. You can put yourself back on page one and work through the process again. Life isn’t always that straightforward though is it? We can’t all go back to the start and give it another go, try putting the pieces in a different order and seeing if the outcome is more desirable. I’m pretty sure that is called a Time Machine and I’ve still not seen one on my recommended for you Amazon homepage. Thought I refresh it a lot! Having an instruction manual for life sounds pretty appealing doesn’t it? Knowing exactly whats going to happen, in what order, a helpful, visual, step by step guide for avoiding the cracks and for everything to go right first time. But where’s the fun in that? Sure, Dad read though the instruction booklet and laid out the pieces, he followed it to a T, but sometimes, those instructions where nonsensical. Bracket A didn’t always, seamlessly, slot into position B, so you’d have to get creative with your solutions, maybe snipping something off, shaving something down, or pure brute force. Regardless of the solution, he still found a way to make it work. Not every day starts off right, not every decision turns out to be the right one. But we can find a way to make it work. We might not currently be sitting at the desk we imagined, and with no instruction manual to hand, we can’t always be sure exactly where we went wrong. But we did, and here we are, and now we have to make it work. We have to knuckle down. We have to get creative. We have to figure this sh*t out. And above all else, we have to keep moving forward. 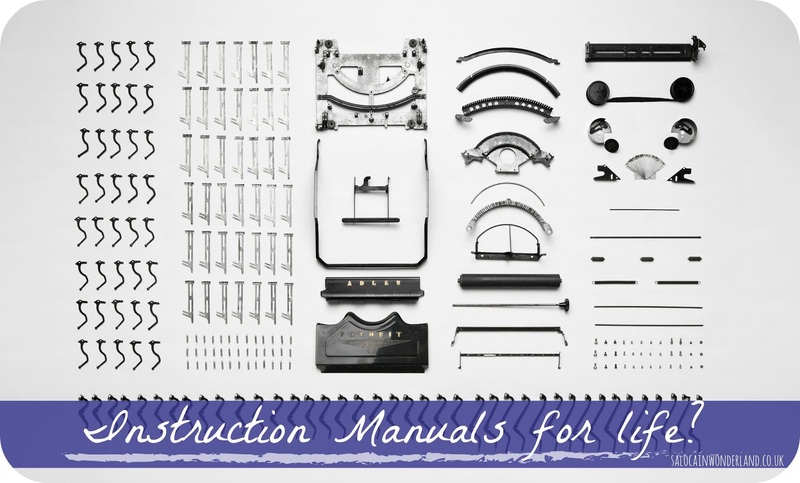 Instruction manuals are great when it comes to putting that mass produced Ikea bed frame together, but when it comes to our own life, there’s no one way to live it. But we can have some bloody fun, interesting, sometimes tearful times figuring it out. Would you reach for the instruction manual or wing it? This post is in collaboration with Manualise. All thoughts, opinions, hope and dreams are my own. For more information please see my disclaimer policy.